I recently got the chance to visit RE-CO BKLYN and got a personal tour from Founder and Owner, Roger Benton, who also owns his own handcrafted furniture business, Benton Custom. While I was there, Roger showed me around the RE-CO BKLYN property in addition to his shop space across the street, located in the 3rd Ward, a huge arts and design collective in Brooklyn that caters to all kinds of artists and creators. 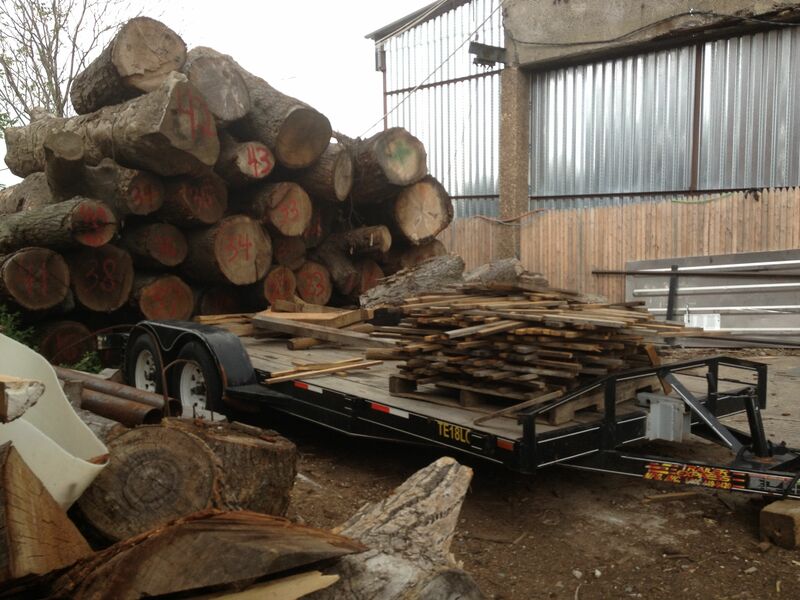 The first stop on my tour of RE-CO BKLYN was the actual sawmill. 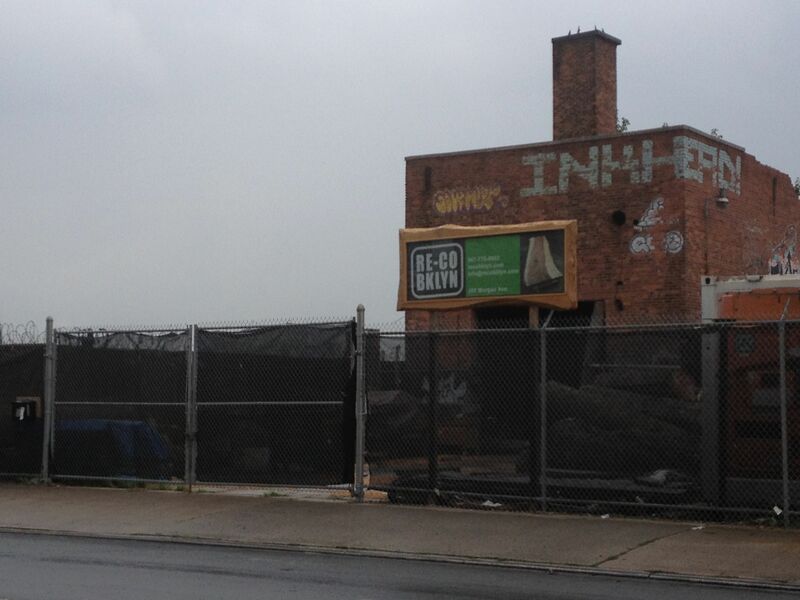 RE-CO BKLYN has a Lucas Mill (seen below), which is both portable and takes up very little space. When I visited, Roger had the mill setup for flattening with a special disc that has teeth that skim the surface of the slabs to cut. 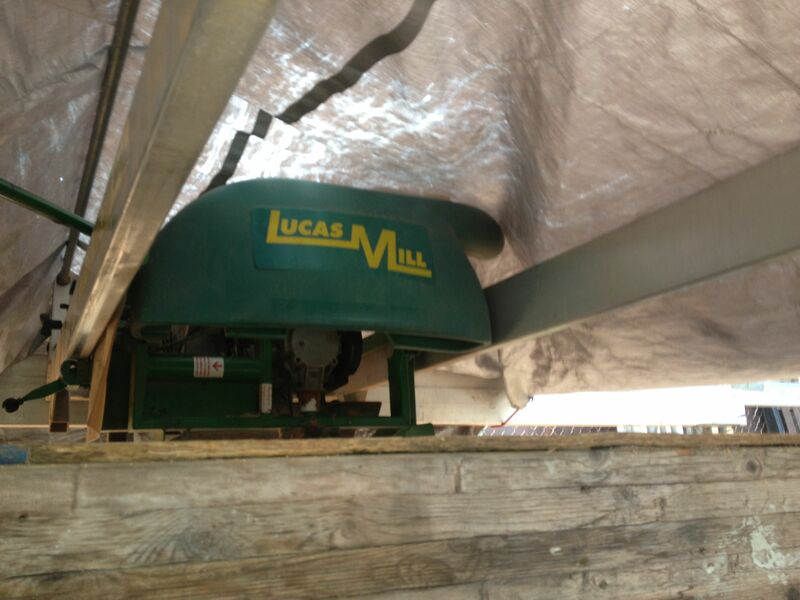 For the Lucas Mill there are basically 3 different attachments including a circular saw blade, a wide slabbing attachment that cuts horizontally (61 inches wide), and the flattening disc, that can flatten slabs as big as what can be cut. After showing off the hardware I got to see the piles of logs that were still waiting to be milled. A lot of RE-CO BKLYN’s supply comes from trees that have fallen in local NYC parks, as well as trees that have fallen throughout the streets of NYC. A lot of the supply that Roger had on hand was actually from the effects of Hurricane Sandy last October, which hit New York especially hard. As you can see below, each log has a number, which corresponds to RE-CO BKLYN’s inventory system and makes it easier to store and organize each piece after it has been cut. The process of obtaining the fallen trees is actually rather simple and there aren’t as many jumps and hurdles that I thought there would be. When trees fall, the parks department wants to get rid of them as soon as possible and are even willing to drop them off at RE-CO BKLYN, sometimes up to 60 logs at a time, which is usually less than a 10th of a percent of what they are actually trying to get rid of. Once they receive a drop-off, it’s time to cut and kiln dry the pieces. When I visited, there was a load currently in the process of drying. I happened to visit on one of the hottest days of the year, which does not make the drying process very easy as far as keeping the temperature controlled inside the kiln. That day Roger had the door cracked just slightly in order to vent the kiln. The current load in the kiln. 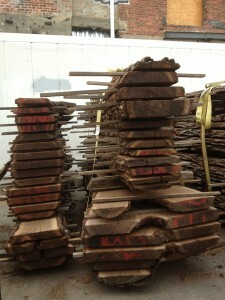 Multiple piles ready to be loaded in the kiln once its done with the current load. 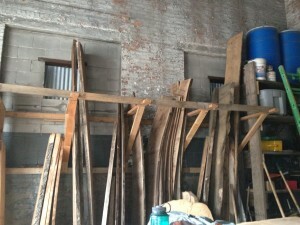 My tour of RE-CO BKLYN continued to their storage area of finished pieces, which had a very organized inventory system. As I said earlier, each log has a numbered label and once it is cut-up, each piece from the log is labeled A-Z and then goes into its own bay for storage. The slabs are then put up on the RE-CO BKLYN website and each piece is shown with measurements, thickness, and price. 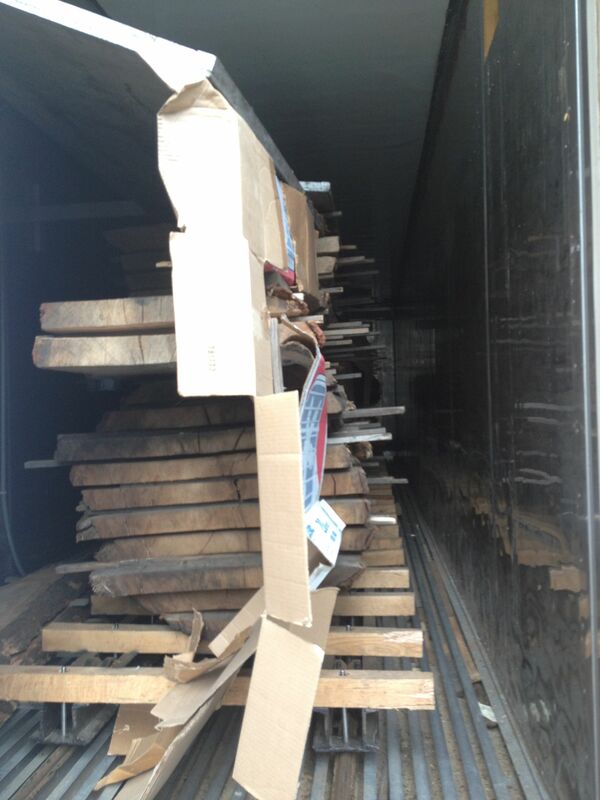 Inventory storage for all of the kiln-dried slabs. These are ready to be sold. I found out that 98% of RE-CO BKLYN’s sales are actually in Brooklyn, where they sell to many local woodworkers and furniture makers. Many of their customers come from Third Ward across the street, which is home to several shop spaces, including Benton Custom. 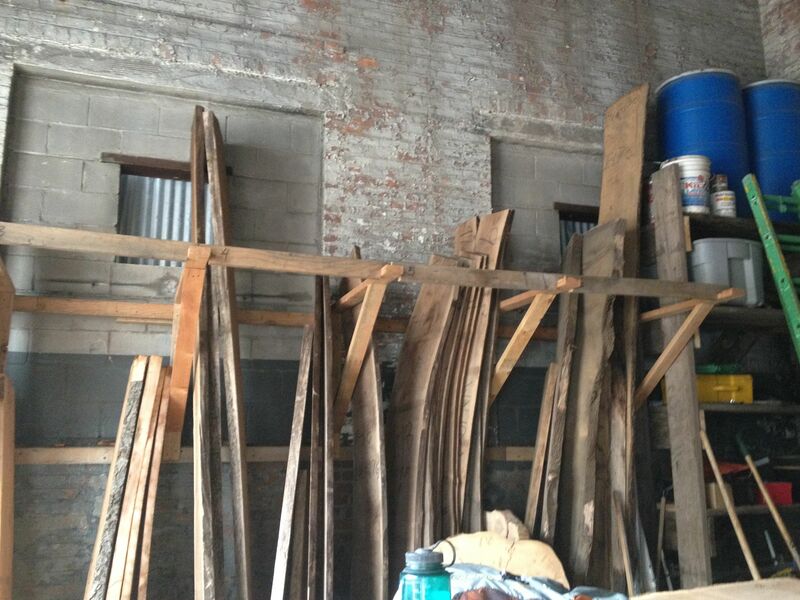 Since all of the wood sold by RE-CO BKLYN is local and reclaimed, they have sold several species that have been salvaged from building remodels and demolitions throughout New York City . These soft woods have included Redwood from local water towers that have been gradually taken down throughout New York, as well as Yellow Pine, and Hemlock. They also had a couple of pieces from several invasive species including several beautiful pieces of Ailanthus altissima*, an Asian species that is called the “Chinese tree of heaven”, and a few pieces of Norway Maple. 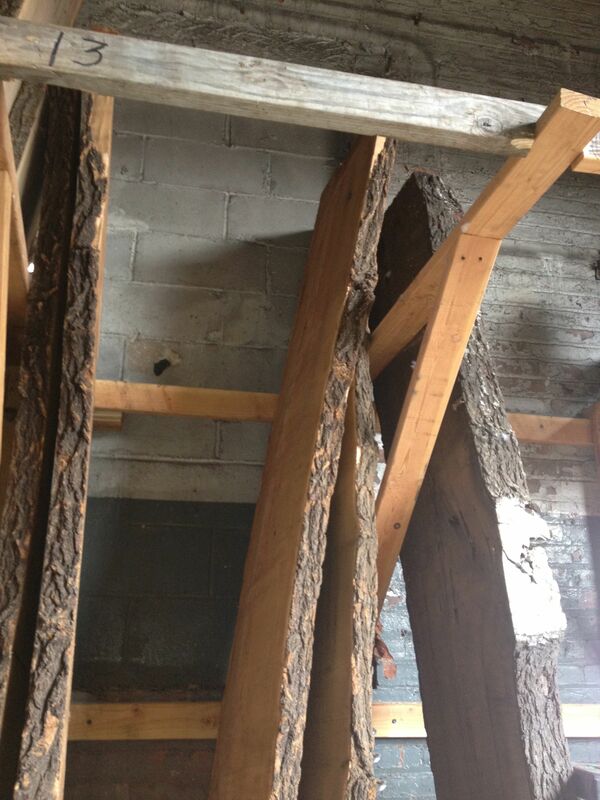 He also had a few pieces from a local mulberry tree that had grown out of control in a Brooklyn backyard. 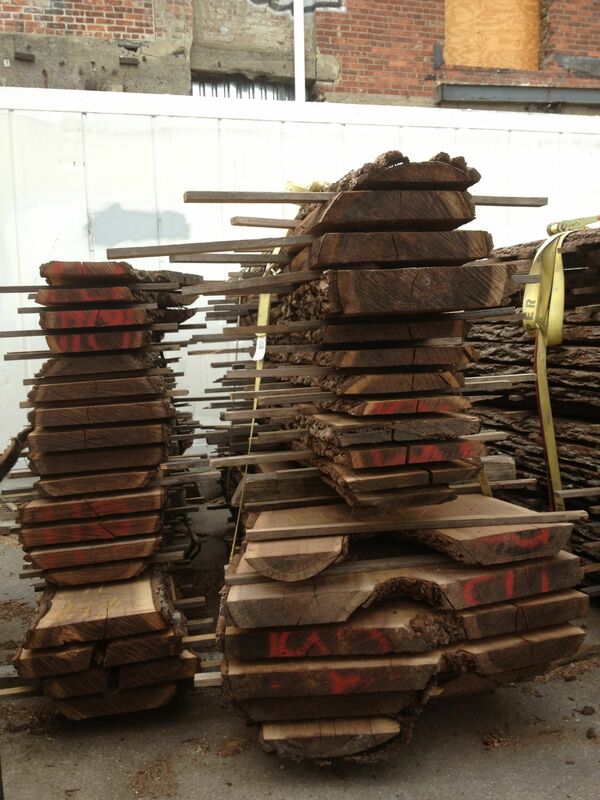 Right now their main inventory includes Oak, Maple, Walnut, Cherry, Black Birch, Hickory and Mulberry. In the meantime, check out the RE-CO BKLYN website HERE and see even more of their current inventory. 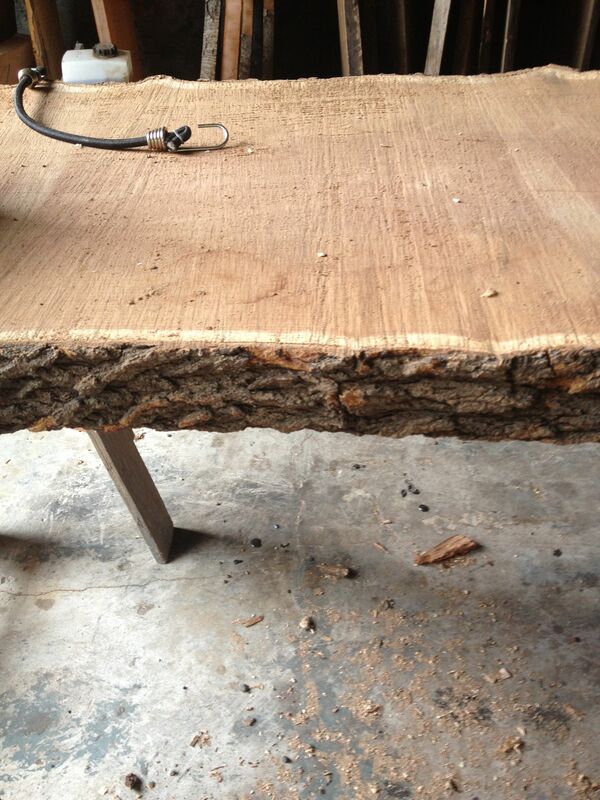 *This article originally called this wood Atlantis, but the actual species is Ailanthus altissima. Next time I visit New York, I’ll stop by. Would love to see some of the Atlantis and Mulberry. That is some nice Mulberry. It’s great what you are doing with it. I find these to be the best work boots I love them, especially when working in tough environments. address and phone number? I want to buy wood. Thanks for giving our updated address info Molly!